Al-Qadir (947 – 29 November 1031) (Arabic: القادر‎) was the Abbasid Caliph in Baghdad from 991 to 1031. Grandson of al-Muqtadir, he was chosen in place of the deposed Caliph, at-Ta'i, his cousin. Banished from the capital, Baghdad, earlier, he was now recalled and appointed to the office he had long desired. He held the Caliphate for 40 years. It was during his Caliphate that Mahmud of Ghazni arose, threatening the empire; and but for the conflicts that broke out in Mahmud's family upon his death, the Buwayhid kingdom, paralysed by damaging war, would have been swallowed. The global Muslim population had climbed to about 4 per cent as against the Christian population of 10 per cent by 1000. 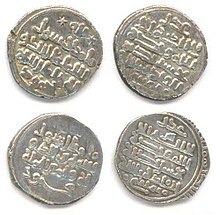 Coins of Mahmud Ghazni with the Islamic declaration of faith. Obverse legend with the name of the Caliph al-Qadir bi-llah (in the fifth line) as the nominal suzerain, al-Qadir name is also minted on gold coins of Mahmud. Reverse legend: Muhammad Rasul/Allah Yamin al-Daw/la wa-Amin al-Milla/Mahmud. Al-Qadir is noted for taking the lead in the Sunni struggle against Isma'ili Shi'ism. He helped Sunnis set up their own festivals to rival the Shi'a celebrations and made the Hanbali school the official Muslim position. Al-Qadir died at eighty-seven years of age in Baghdad, and was succeeded by his son al-Qa'im.